Google Express has an extremely easy checkout process often requiring just 2 clicks, because customers are already logged into Google, and their credit card number is usually stored. That means a very high conversion rate after click on a Google Shopping ad. Like Amazon and Walmart, Google Express takes a commission fee. You also can’t retain the customer information, like email for future marketing efforts. For most companies, the benefits far outweigh the cons. What does Google Express actually look like? When you click on the Google Express ad, you get to a landing page like this, with a ridiculously easy checkout for the user (assuming they are already signed into Google, and have their credit card number already on file). 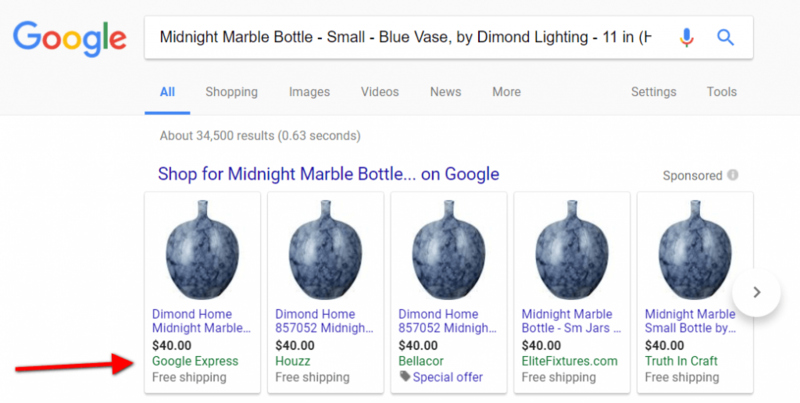 The initial product feed has the same specs as the feed you need for Google Shopping, and includes attributes like: title id sku description link color size and other attributes. The local product inventory feed is a CSV or TSV file (XML is not accepted!) that describes all of your stores/warehouses, prices, and available inventory at each. The specs are actually very similar to a Google Shopping Local Inventory Ads feed. 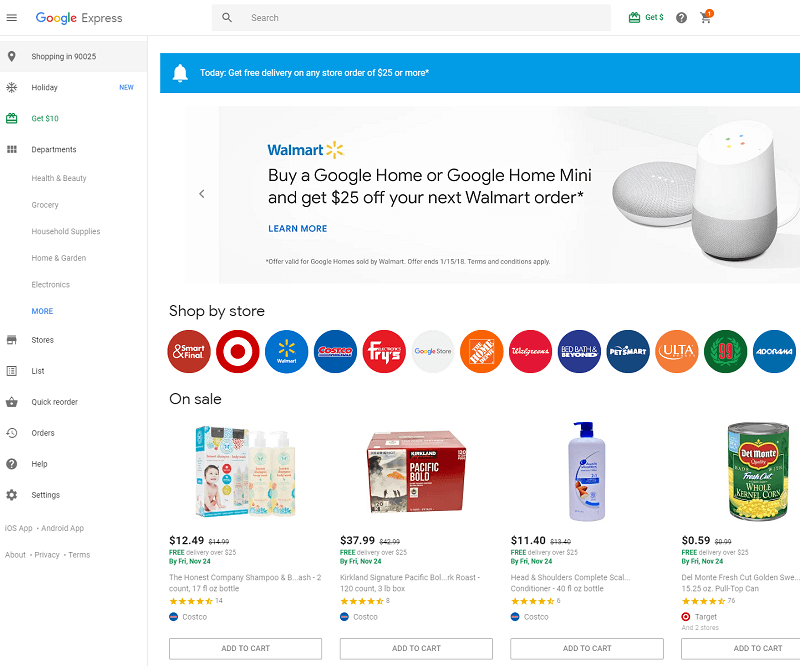 Here are the the Google Express local product inventory feed fields: store code – Required – a unique ID for the store code that matches what you provided in Google My Business itemid – Required quantity – Required price – Required sale price – Optional sale_price_effective_date – Optional availability – Optional weeks_of_supply – Optional – How many weeks of inventory you have pickup method – Recommended – if store pickup is available. The options are buy, reserve, and not supported. pickup sla – Recommended – when the order will be ready for pickup. The options are same day, or next day. First you must mark an order as acknowledged to Google Express. It is here that you specify the channel type of the order, whether it is Purchases on Google vs Google Express – “purchaseOnGoogle” or “googleExpress”. You also specify the order details such as name, shipping type, and address. We make this process really simple with FeedAMP for order fulfillment. This is also made simple with FeedAMP. We do this through the Content API for Shopping inside of Feedonomics. You can also easily get on Google Expressing using Google Shopping Actions. Here’s a guide on everything you need to know about Google Shopping Actions. Want to try Google Express, we can help with the integration front, let us know below! Need Help With Google Express Feed Management?